I bookmarked this recipe long before Pinterest became popular. In fact, it’s been on my must bake list for at least three years. I figured it was finally time that I try these famous cookies. And they did not disappoint. The recipe — an adaptation of Jacques Torres, Mr. Chocolate himself — includes cake flour and bread flour, sea salt, and a dangerous amount of bittersweet chocolate chips. It is recommended that the dough chill for at least 24 hours before baking. Although, admittedly, Nick and I couldn’t resist sampling two cookies each on the first night. They were tasty, but they were also noticeably better after resting in the refrigerator overnight. 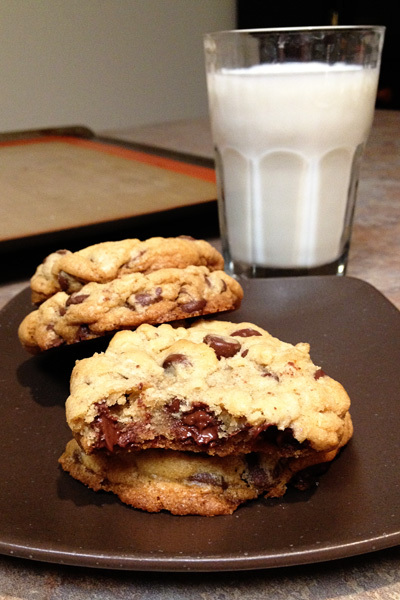 Yes, I do believe that these are my new go-to chocolate chip cookies. They certainly lived up to the hype. Sift together flours, baking soda, baking powder, and salt in a bowl. Set aside. Using a mixer fitted with paddle attachment, cream butter and sugars until very light in color, about 5 minutes. Add eggs, one at a time, mixing well after each addition. Stir in vanilla. Reduce speed to low, add dry ingredients and mix until just combined, 5 to 10 seconds. 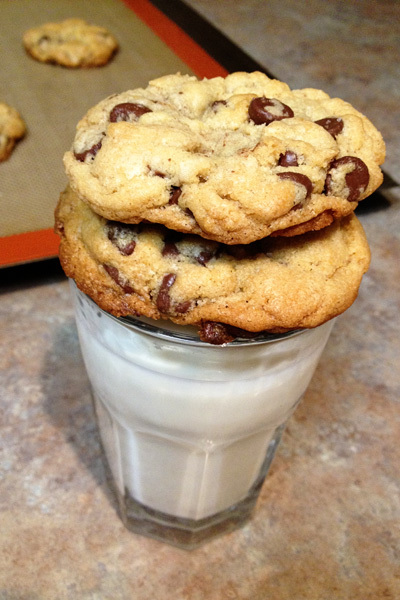 Add chocolate chips and incorporate without breaking them. Press plastic wrap against dough and refrigerate for 24 to 36 hours. Dough may be used in batches, and can be refrigerated for up to 72 hours. When ready to bake, preheat oven to 350°F. Line a baking sheet with parchment paper or a nonstick baking mat. Set aside. 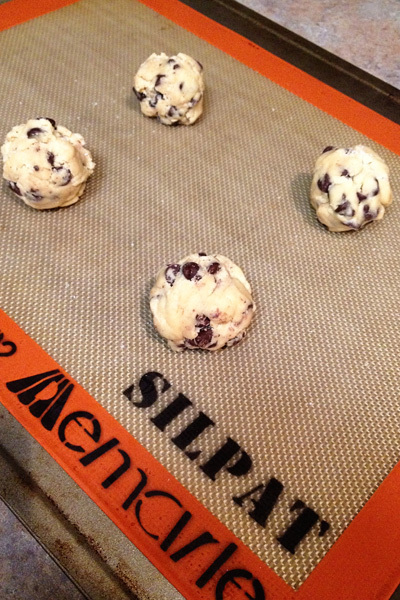 Scoop 6 3 1/2-ounce mounds of dough (the size of generous golf balls) onto baking sheet. Sprinkle lightly with sea salt and bake until golden brown but still soft, 18 to 20 minutes. Transfer sheet to a wire rack for 10 minutes, then slip cookies onto another rack to cool completely. *All photos taken with my iPhone because the DSLR was upstairs and I couldn’t wait to devour these cookies. Thank you for posting this recipe. 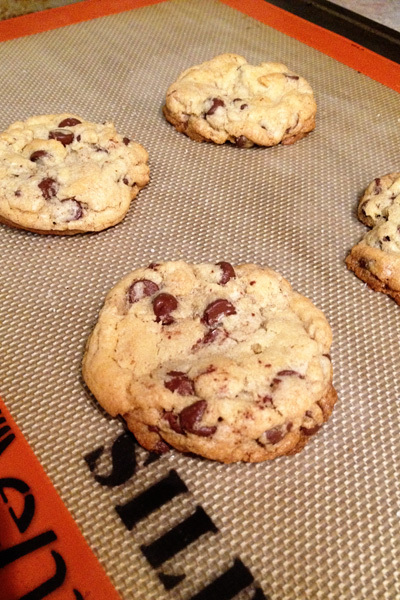 These cookies turned out beautifully, even though I didn’t have time to refrigerate the dough. Hopefully next time I will, if that will make them even better!